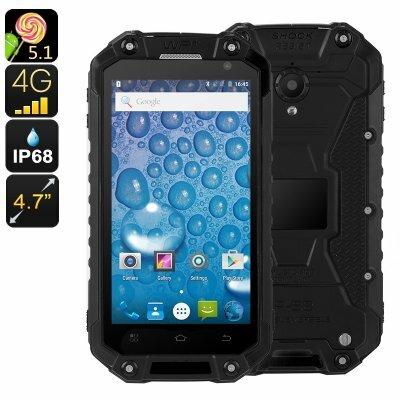 Successfully Added Rugged Android Phone Jeasung X8G - Quad-Core CPU, 2GB RAM, IP68, Dual-IMEI, NFC, OTG, HD Display, Dual-Band WiFi, 4G (Black) to your Shopping Cart. If you are looking for a cheap Android phone that follows you anywhere you go, the Jeasung X8G is a great choice. This rugged smartphone features a durable IP68 design. Thanks to this, your Android smartphone is fully resistant to water, dust, and drops. If you spend much of your time in the outdoors or work in a tough environment, this cell phone is perfect for you. It has been designed to withstand a hit, meaning it won’t instantly break on impact. No matter how tough your environment, the Jeasung X8G will always keep you connected. With its Android 5.1 operating system, it allows you to undergo a smooth user experience while enjoying the latest Applications. Packed within its rugged body, this Android smartphone holds a Quad-Core processor. Along with 2GB of RAM, this chipset manages to bring forth a powerful performance. You’ll be able to watch films, play games, and browse the web. Nothing is too much for this cheap Android phone. With access to the Play Store, you can easily download the latest mobile entertainment straight onto your cell phone. On its 4.7-Inch HD display, you’ll be able to enjoy all your favorite media in crisp 720p resolution. This display supports IPS technology which means you are treated with great visuals no matter your viewing angle. With two SIM card slots and 2-IMEI numbers, this rugged phone brings along great connectivity. You’ll furthermore be treated with 4G support and Dual-Band WiFi. This means that you’ll always be able to browse the web at lightning speeds. Download Apps, stream movies, and engage in online calls – nothing is impossible for this Android phone. Thanks to its whopping 4000mAh battery, you’ll be able to make use of all the phone’s features for up to 15 hours in a row.